Yellow roses represent joy and wisdom and is often associated with cheerfulness, sociability, and happiness. There are very few flowers that can bring a smile to people more than receiving yellow roses. Expresses joy and gladness - the best gift for new mothers, newlyweds and graduates. Yellow roses are also a "not-too-obvious" reminder for the busy husband, wife, boyfriend or girlfriend. 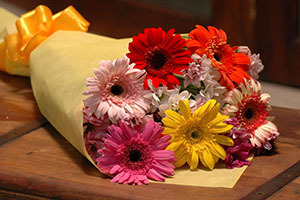 Brighten someone's day with sending our 14-16 inch petite yellow flowers.